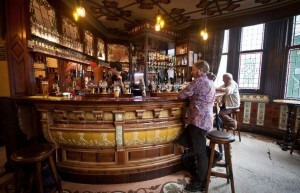 ONE of Tyneside’s most famous pubs aims to stay ahead of the game with a £150,000 facelift. Rosie’s Bar on Stowell Street is popular with football fans, locals and foreign visitors with many coming to admire its famous moving heads. New owner, well-known Tyneside pub entrepreneur Harry Costigan, has unveiled plans to restore the bar to its former glory. Costigan has contracted specialist Newcastle-based interior design company Fluid Design Solutions to breathe new life into Rosie’s. “Rosie’s Bar has always been a favourite with the football crowd on match days and regulars living around the Blackfriars area, but interestingly, it has recently found its way into the list of ‘must see’ places for tourists visiting the city – particularly those from Scandinavia – in their quest for a traditional British pub. “Bearing in mind people’s affection for the pub, it is quite a delicate design brief because we are conscious of not wishing to spoil what is already there. But over recent years, it would be fair to say that Rosie’s advanced years have been creeping up on her, so we will be giving her a bit of a facelift during February. “The main objective of the facelift is not to take away the quality that is already in place in Rosie’s but to add to it. “We will be introducing a cosier colour scheme, special effects artwork and, crucially, new feature lighting to the windows and ceiling, all combining to create a warm and welcoming environment for patrons to enjoy into the new decade. “The refurbishment work will not begin until well after the Christmas period. Fluid Design Solutions is part of Fluid Group, which operates high profile bars and restaurants in Newcastle city centre: Barluga, Perdu, Quilted Camel, Mushroom Bar, Blackie Boy and Fluid Bar & Kitchen. Its coffee brand, Central Bean, has three outlets in the region with plans for expansion outside the region in the New Year.